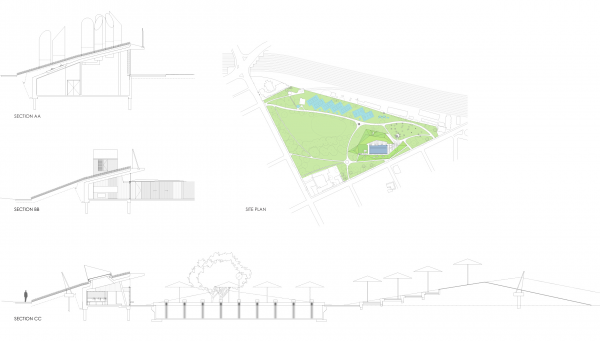 Located at the edge of central Sydney, the ambition of the project was to reinvigorate the under-ulitised 7.5 hectare park, and upgrade the tired public pool. The overriding principle was to premiate landscape over built form, based on a conviction that in these inner urban areas, green space is sacred. 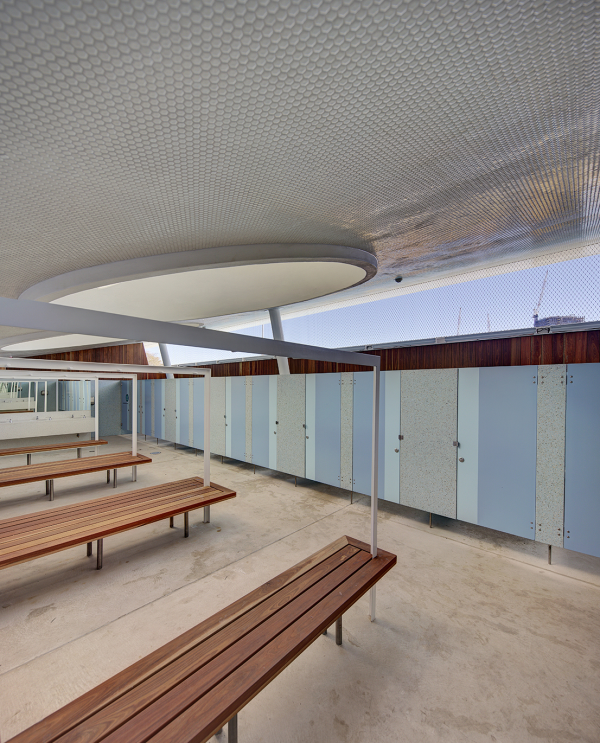 Neeson Murcutt Architects with the City of Sydney, have embedded a new 1000m2 pool facilities building as a piece of ‘folded landscape’ with a green roof of native ‘meadow’ grasses by Sue Barnsley Design. In this single move the building disappears from the adjacent street, and is integrated with the rolling park landscape. 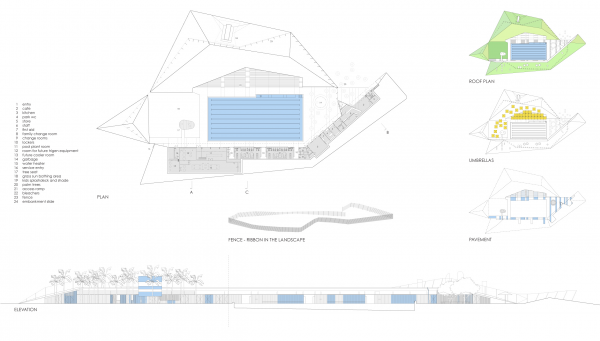 The building is intimate and monumental (generally 6m deep x 125m long) – scaled to the swimmer and to the city. Blue coloured stripes accentuate the topographic quality of the project by de-emphasizing the distinction between building wall, pool concourse and bleacher seat. The ephemeral fence, yellow umbrellas, blue and white toddler shade structure, over-sized tree-seat, coloured ‘chimneys’, palm trees and mound slide, bestow a playful character. They are the ‘follies’ within the Victorian park. 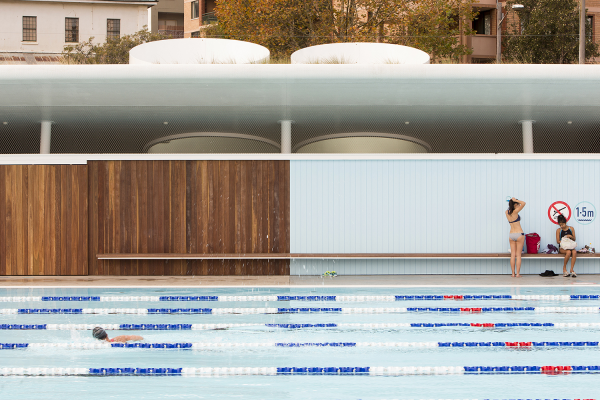 The upgraded pool is the City’s first pool that is fully trigeneration ready, a testament to the City of Sydney’s ambitious sustainability aspirations. 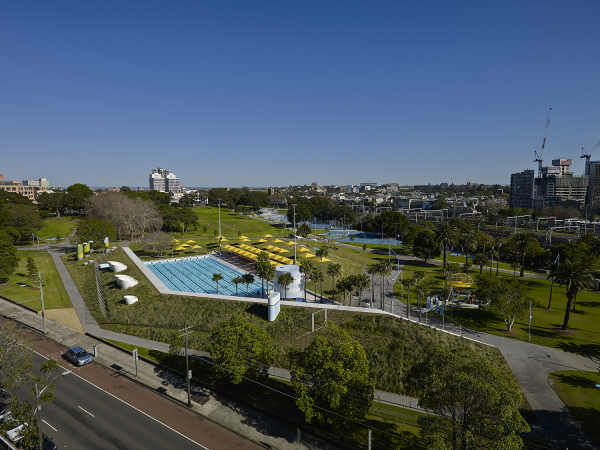 The Prince Alfred Park and Pool upgrade has reinvigorated this, the largest public open space in Surry Hills. Once a park that was under-utilised, it has already become a popular year round destination. The existing 50m pool is retained and upgraded to meet the City’s sustainable aspirations and current access standards, including an accessible pool ramp. Two crisply shaped landscape mounds define the space of the outdoor pool enclosure, simultaneously connecting and separating park and pool. The new building houses all the required support including ticketing, change rooms, plant, offices, first aid, café and kiosk. 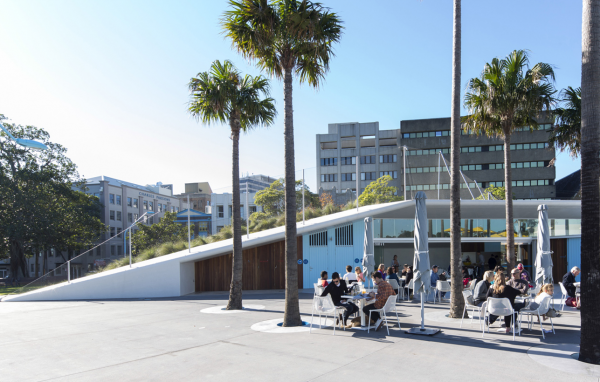 Owned by the City of Sydney, the pool and café/kiosk are run by independent operators. The project incorporates the best in sustainable practices and is the city’s first pool facility that is fully trigeneration ready. The long, thin building is both intimate and monumental. This play between scales is a deliberate and fundamental theme throughout the project – scaled to the park and city, scaled to the individual swimmer. The simple materials palette – concrete, timber, tile, planting – is robust, and importantly, unifies pool and park allowing the building to sit confidently within this parkland without compromising or cluttering this prized open space. The green roof is critical to the realization of the building as a piece of ‘folded landscape.’ The biggest its kind in Sydney, it is topped with 35,917 plants, completely concealing the facility from the street. Evoking the pastoral character of the Cleveland Paddocks from the early 19th century, the meadow of seasonal and flowering native grasses provides important habitat for urban wildlife. The continuous concrete cantilevered soffit-ceiling-rear wall, is lined with tiny white tiles that reflect light and give a beautiful liquid quality that amplifies the watery environment. Large conical skylight shafts allow private views to sky. The timber clad poolside walls resonate with Victorian era pool change sheds. Painted wall stripes align with two-tone concrete paving in off-white and blue, to create a visual continuity. 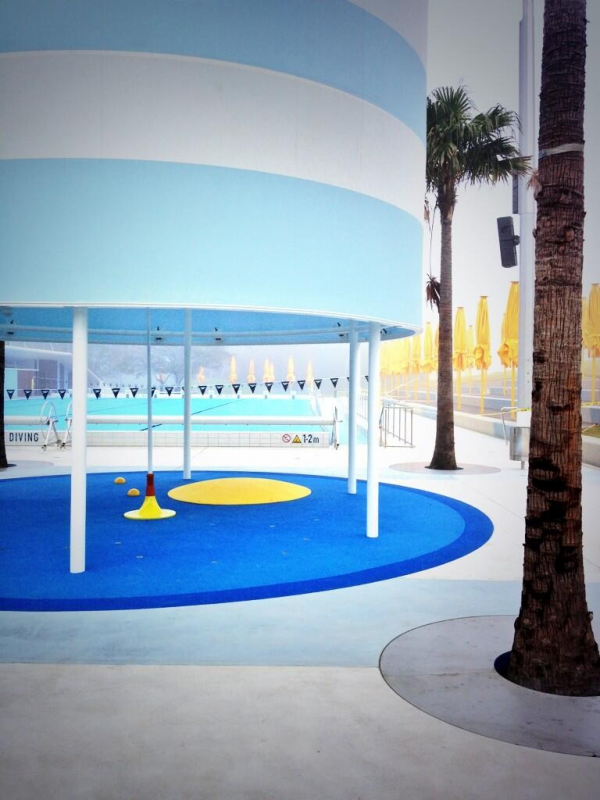 The colour reverberates within the park, and resonates with the previous 1958 pool facility and the memory of a similar blue hue. Elements of the pool enclosure – fence, umbrellas, toddler shade structure, tree-seat, chimneys – bestow a playful character as ‘follies’ within the Victorian park. Transparent mesh fencing is like an ephemeral ribbon in the landscape. 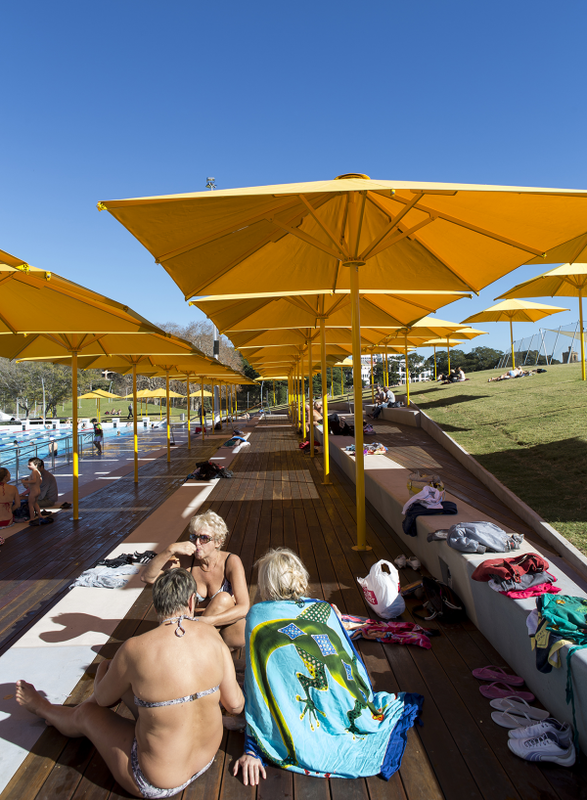 Operable yellow umbrellas scattered across the grassy sunbathing and sitting areas provide ‘flexible’ shade. Palm trees create an inviting shady environment at the entry, metaphorically extending the park into the pool. An independent structure to the toddler splash deck supplements the shade of the palms. Its circular shape recalls the the ‘circuses’ of horses, cattle and pigs from when the park was an exhibition ground. The greatest design challenge was making the 1000m2 building ‘disappear’ within its park setting. This was achieved through the folded landscape strategy, which also concealed the presence of Chalmers Street with its busy traffic, from the actual pool. The meadow roof was meticulously detailed to provide adequate soil depth, stability, irrigation, and a mix of species, textures, colours and flowering seasons. Two crisply shaped landscape mounds define the space of the outdoor pool enclosure, simultaneously connecting and separating park and pool. 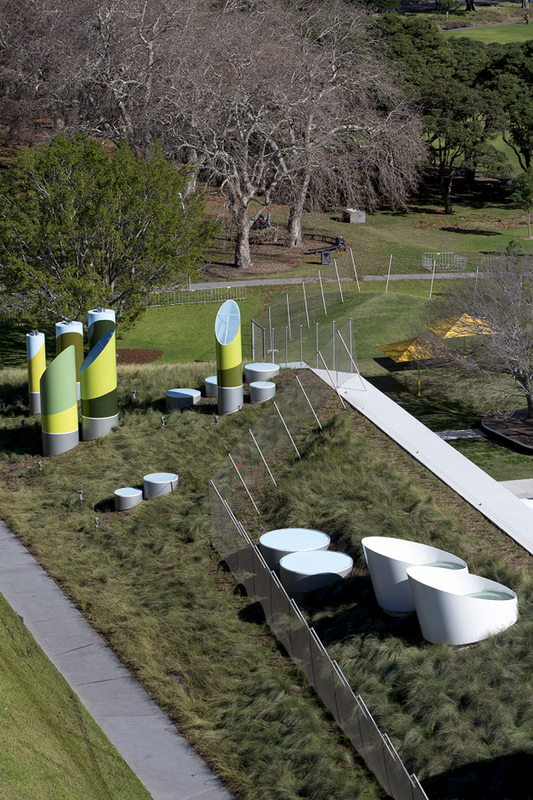 They were created from soil on site, and provide wind protection to sunbathing areas. Chlorinated pools are known to be a highly corrosive environment for building materials. We worked with a building chemist, façade engineer and tile expert, as well as an experienced aquatics engineer, on materials and material connections. The fluing of pool plant, building services and future planned trigeneration equipment through the meadow roof, was a particular challenge. Rather than consolidating the flues into a single vent, each is separated so as to be as thin as possible. Artist Sonia van der Haar painted the chimneys an array of greens taken from the colour of fig leaves and other plant material found in the park. With the complete installation of the trigeneration there will be a total of twelve at the southern end of the meadow. The design of the enclosing fence and provision of shade were other design challenges to which we sought a playfully artful response. •	environmental messages through signage. This award celebrates the design process and product of planning, designing and constructing form, space and ambience that reflect functional, technical, social, and aesthetic considerations. Consideration given for material selection, technology, light and shadow. The project must be constructed.